Franchisees at Metro Rod, the market leader in commercial drainage, together with Support Centre teams, the Franchise Brands Board and key partners and suppliers, gathered last weekend at the prestigious Celtic Manor Resort for a spectacular annual conference and awards ceremony. The conference is a flagship event in the Metro Rod calendar and is a fantastic opportunity for everyone to recognise and celebrate the substantial success and achievements of the business as well as to hear first-hand the exciting growth prospects for Metro Rod and how they will be realised. “The theme of the 2018 conference was “focused on what makes a difference”, but with a particular emphasis on the importance of first-class customer service and operational excellence. We also recognised and applauded the heroic efforts and commitment of our dedicated engineers in serving our customers 24/7/365”. “Metro Rod has experienced tremendous growth over the past year since the launch of our “Vision 2023” strategy. Nearly 80% of our franchisees have experienced sales growth and a number have enjoyed very substantial levels of growth. This is testament to the passion, hard work and commitment of our franchisees and their dedication in providing a first-class customer experience. It also reflects the substantial support we provide them with on a daily basis. Our franchisees can look forward with confidence to an exciting future with Metro Rod”. Chief Information Officer, Colin Rees, and Head of IT, Tim Roberts took to the stage to update Metro Rod franchisees on the substantial investment already underway by Franchise Brands plc to digitally-enable the business. This investment will ensure Metro Rod can stay ahead of the game when it comes to providing a first-class service to its customers. Craig Henthorn, Marketing & Sales Director at Metro Rod also updated the network on the impressive initial results being generated from the new integrated marketing and sales strategy launched earlier in the year following a bold and exciting re-branding. Franchisees have benefited from record-breaking lead generation with much more to come in 2019. Peter Molloy also acknowledged the considerable traction being generated by the Metro Plumb business, which has been developed by Metro Rod franchisees since its launch in 2016. As a result of this recent growth, the conference was excited to welcome to the network the first stand-alone Metro Plumb franchisees, Riaz Contractor and Josh Crofts, who manage the South London franchise. The sizable plumbing market offers huge potential and we will be awarding further independent Metro Plumb franchises as the business continues to expand. Metro Rod award winners were announced at a gala black-tie dinner for nearly 200 people, with some top-class entertainment and dancing into the night. It was a glittering evening, mirroring the success and achievements of the top performers within the business. 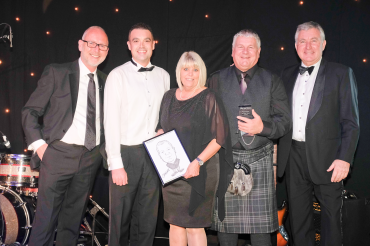 Many Metro Rod franchisees and their teams were recognised and rewarded for their considerable achievements, with the highly-coveted ‘Franchisee of the Year 2018’ award presented to Graeme and Avril Stevenson of Metro Rod Manchester South and Central. “Graeme and Avril have delivered exceptional levels of service during the last year which has resulted in spectacular growth in sales and in the size of their business. I am personally delighted for Graeme and Avril. They are exactly the type of franchisees we want in our business. They embrace the support from the franchisor while using their own entrepreneurial skills to build a great business in their territory”. During the conference, all franchisees had the opportunity to explore the expo hall which played host to a number of leading industry suppliers with interactive areas, live demonstrations of services and equipment plus several brand-new Metro Rod vans. The conference attracted a record number of sponsors with the official sponsor being iTouch Systems, a leading provider of CCTV inspection and reporting solutions. “This was the best Metro Rod conference we have ever attended! There was a tremendous atmosphere throughout and all the franchisees were very positive about the future. iTouch Systems was thrilled to be the principal sponsor of the event and we had a great response on the stand and subsequently, with a number of franchisees taking advantage of the opportunity to invest further in their businesses”. “Our franchisees are the bedrock of our business and I applaud their passion, commitment and entrepreneurial flair. Metro Rod has enjoyed an incredible year and the business is going from strength to strength. The achievements on display demonstrate how the combined efforts of hard-working and motivated franchisees and dedicated Support Centre teams, together with the investment Franchise Brands is making in the business, can produce great results”.